Chicago Quigley North High School "Norsemen"
Chicago (population 2.7 million) is located in far northeastern Illinois in the center of Cook County. Chicago is famous for many different reasons and was a great influence on the growth of the United States in the early 1800s. It is, today, the third largest city in the United States and Illinois' largest city. The Catholic religion and establishment of a Catholic education has had a strong influence in Chicago neighborhoods almost from the time Chicago was settled in the very early 1800s. Archbishop James E. Quigley was one of the early pioneers who recognized the need for a high quality education with a religious basis. 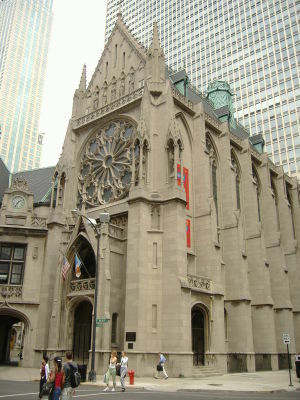 Archbishop Quigley established a school for high school boys in 1905. Archbishop Quigley died in 1915, however his dream of a high school in Chicago lived on. In 1916 a high school building was erected in what is now downtown Chicago at Rush Street and Pearson Street. The school truly flourished until it reached a peak of 1300 students for the four high school grades in the mid 1950s. Quigley High School grew rapidly and became the largest Catholic Seminary School in the nation. The vast growth made it necessary to build a new school to accomodate the influx of students. In 1961 it was decided to purchase land and erect a school on the city's south side. Quigley South High School was built on Western Avenue at 77th Street. The Quigley High School building which remained at the same location downtown was now called Quigley North High School. Much of this information was found on the Quigley Preparatory Seminary website at www.quigley.org. The enrollment at both Quigley schools began to steadily decrease in the 1970s. By the mid 1980s several changes began taking place with the Catholic Church and its school system. The decreasing enrollment and changes taking place led to the reorganization of the Quigley Schools. Quigley South and Quigley North were merged back into one school in 1989 and the school renamed Quigley Preparatory Seminary . The students would now attend school back at the original downtown school location pictured above. Quigley North team nickname: the "Norsemen"
There is very limited coverage of the Quigley North Norsemen athletic program on the IHSA website (www.ihsa.org). Boys basketball has the most extensive, in fact only, coverage on the site. We are certain that track and baseball were likely offered as well. Possibly even soccer, wrestling, and other sports were offered for some period during the school's existence. We are searching for the school's fight song and information on any other sports in Quigley North's brief history. The Norsemen do not appear to have won any IHSA hardware. The basketball teams are covered from 1964 through 1988. Nine of these teams had records of .500 or above. Coach's names and the better team records are listed below.